A waitress in a small (Southern? Southwestern?) town, Jenna (Christine Dwyer) is stuck in a miserable marriage to abusive Earl (the villain of the piece, a monster performed to perfection by Matt DeAngelis, who also stepped into the role on Broadway). Fortunately, she has two best buds at work who always have her back (and save her bacon): geeky Dawn (funny, quirky Jessie Shelton) and brassy, say-it-as-you-see-it Becky (powerhouse Maiesha McQueen). Jenna really needs them when she finds out that she’s (quite unexpectedly) pregnant, and isn’t at all sure that she’s mother material — while her pals have been encouraging her to leave the nasty (all but moustache-twirling) Earl. The story is primarily about female empowerment, and the three gals’ voices meld beautifully, in tight harmonies that mirror their close, mutually supportive relationship. But there are a few more sensitive men: the pie-shop owner (Larry Marshall, who doesn’t seem as cranky as described); the gals’ supervisor, Cal (burly, amusing Ryan G. Dunkin) and the weirdo nerdy Ogie (terrifically agile and hilarious Jeremy Morse, who originated the role on Broadway and nearly steals the show). Ogie and Dawn turn out to be a dweeb-match made in heaven. The show is based on the 2007 Sundance Festival indie film of the same name, written, directed and co-starring Adrienne Shelly, who was murdered in her home before she got to experience any of the far-reaching success of her creation. This touring production is dedicated to her memory. 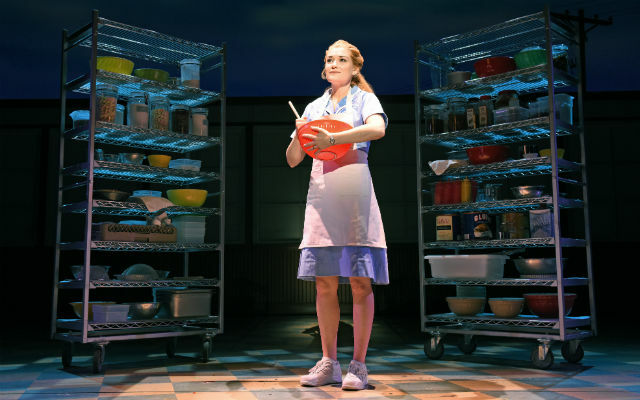 The musical, with book by playwright Jessie Nelson and music and lyrics by pop-rock singer/songwriter Sara Bareilles, premiered on Broadway in 2016, where it garnered four Tony Nominations (including Best Musical), and is still going strong after more than 1000 performances. The national tour kicked off in October 2017, but as is often the case, San Diego doesn’t get most of the performers who made it to Washington D.C. and Los Angeles. Still, it’s a very appealing cast, and the singing is strong throughout. The secondary characters may be a little over-the-top, but then, so are some of the wacky pie ingredients. Only a baking superhero could make those things hang together and become edible, not to mention deeply influential and redemptive. In this fable-like tale, Sara has that power. The six-member often-onstage band (music direction by Robert Cookman, with orchestrations by Bareilles and The Waitress Band, and arrangements by Nadia DiGiallonardo) captures the appealing and melodic score, which is primarily folky and country, punctuated by a few potent, introspective ballads. The lyrics, difficult to discern in the Civic Theatre, are clever and heartfelt. The direction, by Tony Award-winner Diane Paulus, can be a bit fussy, with stylized hand motions for the chorus, who are frequently in constant movement (which was also the case in Paulus’ hyperactive staging of “Pippin”). The choreography (Lorin Latarro) is whimsical, the ingeniously flexible set (Scott Pask) is attractively lit (Ken Billington). If only the sound were sufficiently crisp and the words comprehensible. Clearly, it’s not just a problem of the venue, since every word was crystalline when “Hamilton” settled into the Civic. A more advanced sound system, please! 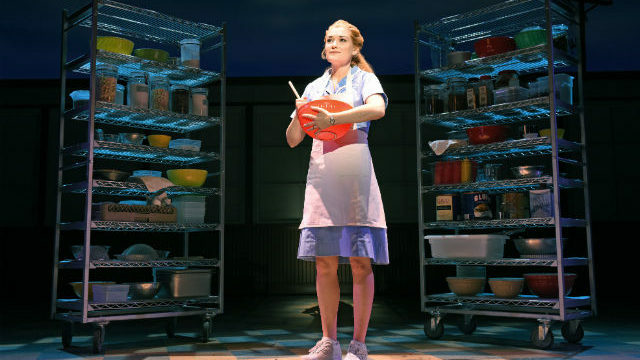 Like the pies themselves, this musical (and this polished production) can be sweet or savory, tart, piquant or a little flaky, but overall, very tasty and satisfying. The remaining performances are Friday and Saturday at 8 p.m., Sunday at 6 p.m., and matinees Saturday at 2 p.m. and Sunday at 1 p.m.